Minimum length; 10 feet, Maximum 50 feet. If you order over the limit, we will cut equal lengths and add an adaptor to connect the lengths together. Prices are per foot. To order the components needed for your application with your custom cut OvalFlex goto Large OvalFlex for Large and Small OvalFlex for Small. This is a Special Order Product. It must ship Freight Line! Pipe will be shipped from the factory in Ohio the following day after orders placed before 1 PM EST. Additional charges will need to be applied to your order after the order is processed for Freight Truck expenses. You will be notified before extra charges are applied to your card. 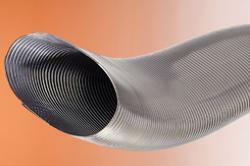 *Click here for Flexible Liner installation diagrams.